Today, on October 10, Rakul Preet Singh, one of the top actresses in Tollywood, is celebrating her birthday. She turns 26 today. 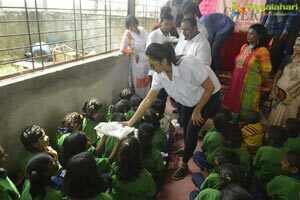 On this occasion, Rakul Preet Singh visited Rajendra Nagar School in Hyderabad to distribute books, pens, pizzas, burgers and sweets to the kids studying there. She entertained kids with her dance and performance. Jabardasth fame Racha Ravi has made kids happy with his comedy. 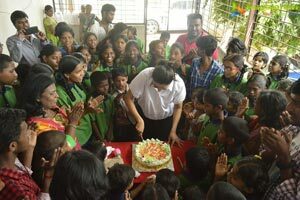 Rakul Preet Singh’s manager Harinath, Pawan Kumar and Cherish and Orphanage team Hemalatha, Neelima and Kiran were present at the occasion and made it successful. Rakul Preet Singh, who was born in a Panjabi family in New Delhi, has featured over 15 films in Telugu, Tamil and Kannada in her sever years film career. She is one of the most sought after actresses down south today.